August’s heavy, sticky air is the perfect signal for us all to slow down. As summer draws to a close, let’s draw from its softness and mellowness to inspire relaxation and contemplation within ourselves. August’s selection of the best new yoga music is full of atmospheric ambiance and soothing global soundscapes, and we think you’ll find it perfectly suited for the languid energy of the month. This hour-long album is an ambient remix of B. Ashra’s beautiful solo flute piece, ‘Venus Meditation’. The remix adds echo and reverb, layers of soothing drones and synth waves, and comforting organic sounds to create a soundscape all its own. You’ll love listening to this album during deep relaxation, meditation, or restorative yoga. This lush ambient album creates an immersive drone soundscape filled with layers of shimmering electronica elements. A few of its compositions build off a background of nature sounds—field recordings of rain and birdsong. Each of the ten tracks has a unique flavor, but the overall album has a gentle and peaceful vibe that makes it great for meditation and shavasana. Inspired by the “magical hour after sunrise in which the earth is bathed in gold,” these six ambient tracks create a deeply expansive and lush soundscape. Layers of soaring, soothing electronic sounds intertwine with drones to create a wonderful backdrop for contemplation, meditation, and introspection. Embark on a mystical sonic journey as you play these five beautiful compositions of strings, doumbek drums, synths, and drones. The tracks on this album vary in tempo, so you’ll find one that suits just about any practice style—try one of the faster tracks for an active vinyasa yoga flow or a slower one to support meditation and shavasana. This solo acoustic guitar album from multi-instrumentalist Matt C. White is gorgeously intricate and calming. Two layers of melody slowly and softly intertwine throughout these nine mellow tracks, making them perfect to play during a gentle yoga practice. This soundtrack is a collection of compositions McGowen created while writing his book of the same name. Both the book and soundtrack are intended “to bring the reader or listener to a place in which there is no fear.” Drifting waves of saxophone weave through swells of orchestral melodies and synth pads, giving these 16 tracks a romantic and cinematographic feeling. This first album from California-based kirtan artist and yoga teacher Julia Berkeley is filled with obvious sweetness, devotion, and joy. 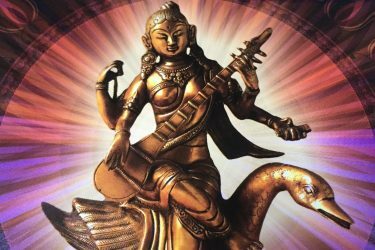 Beautifully recorded and produced, these five original mantra compositions will have the most potency when played during the beginning or end of a powerful yoga practice. Each month we hunt through all of the new yoga music releases to select the best albums and EPs suitable for a yoga practice. Signup to our newsletter and/or social media to be updated on future posts or browse through our archive of previous yoga music articles.